NASA Wallops Flight Facility, Virginia — During the past week, Operation IceBridge teams have worked at NASA’s Wallops Flight Facility on the eastern shore of Virginia, transferring the science instruments from the DC-8 onto a NASA P-3 Orion aircraft that we will use for the second half of our Greenland campaign. NASA’s fleet of research aircraft allows us to choose the aircraft that is best suited for the science goals that we want to accomplish with IceBridge. We began our work in Greenland with the DC-8 because of its range, load carrying capability, and its ability to fly very high. With the DC-8 we have surveyed the sea ice in the Arctic Ocean and numerous glaciers in northern Greenland. For the second half of the Greenland campaign we will focus on mapping glaciers in southern Greenland using the NASA P-3. The aircraft’s range and maneuverability are ideally suited for low-altitude glacier flying. During the past three months, IceBridge teams from the Center for Remote Sensing of Ice Sheets (CReSIS) at the University of Kansas and Wallops have worked hard to make the impossible possible: designing and manufacturing a complex array of 16 ice-penetrating radar antennas mounted under the wings and the belly of the P-3 and installing and test flying it in only three months! The array of radar antennas is a new development that has never been flown before, allowing us to map heavily crevassed outlet glaciers in unprecedented detail. We will collect several Terabytes of data during each flight that will be processed on a supercomputer at CReSIS when we are back home. The complex array of antennas will allow IceBridge teams to distinguish between radar clutter from surface crevasses and the very weak echo reflected from the base of the glacier of interest. We have now completed a series of mandatory test flights at Wallops to verify the antenna installation and aircraft performance during flight and to check out our science equipment before we leave for Greenland. 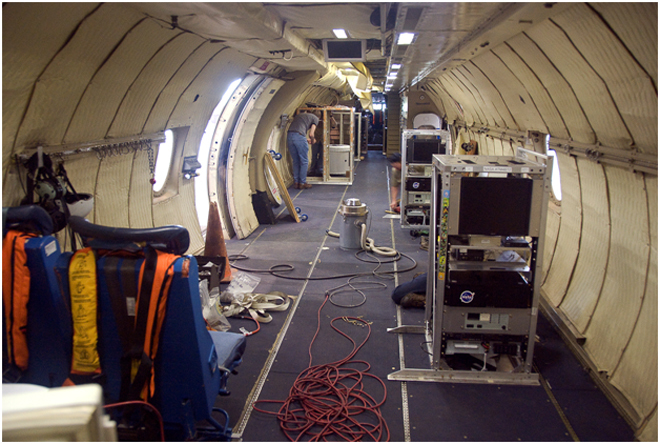 Research flying has not much in common with everyday air travel. One of the maneuvers that we do during the test flights is to fly the aircraft at a 90° roll angle with the wings perpendicular to the horizon. Fasten your seat belts! You will never experience something like this on a commercial flight. If you do, you might want to consider using a different airline next time. NASA’s P-3 aircraft during a test flight over Wallops Island, Va. The ice-penetrating radar antennas for Operation IceBridge are mounted under the wings and the belly of the aircraft. Images are courtesy of Rick Hale, CReSIS. One of the major science goals of Operation IceBridge is to understand the contributions of the Greenland and Antarctic ice sheets to global sea-level rise. During one of the test flights we use the Airborne Topographic Mapper laser system and high resolution aerial photography to map beach erosion on Wallops Island, the location of NASA’s rocket launch facility. Here, at the coast of Wallops Island, rising sea-levels and increased beach erosion are real and need to be considered in long-term planning for the launch facility. We have now completed all our test flights here at Wallops and are ready to go back to Greenland where we hope to map many of the outlet glaciers and contribute to our understanding and knowledge of future sea-level rise.